Oh this is super petty, but in line of discussion of an un-related topic at Penn State yesterday- the need (or desire) for dis-aggregation. In this case, I just hate the wastefulness of hotel packaging of these coffee condiments. 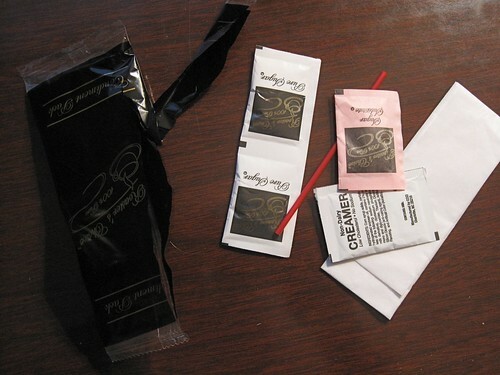 The black plastic sack on the left (waste) includes 2 sugars (waste- I am diabetic), one artificial sweetener (the one thing I want), a creamer (no need), a straw (I can stir with my finger, and a napkin (I can be neat). So once I grab my one item of interest, the pink packet, the rest go into the waste stream, to the landfill. So it is more efficient for the hotel to buy stuff I don’t use, put into the trash, than just to dis-aggregate the content to a level where I can select just what I will use. So is there any other (ahem) system (ahem) where we package things like (ahem) this? Hahahahahah, beautifully done, the metaphor was calling and calling and calling, and you just let it hang. You’re the master! I do use some sugar and creamer from those packets, but I am usually by myself so I only use half. I just hate it when they insist on pitching out the other half that I neatly put back in the tray so that I can use the stuff on day 2!